As this Summer comes to an close, we reflect on all of the amazing adventures that we had. One of the colors that best represents the Summer is the color, yellow. The symbolic representation of the color yellow is: renewal, like the sun's never ending energy. Sunlight is a color that normally incites a feeling of happiness. Why not capture this same feeling with your engagement ring? As an engagement ring, a yellow diamond is very popular choice in Hollywood. From Kelly Clarkson to Carrie Underwood the yellow diamond engagement ring is sure to turn heads. Here are some new styles being launched from the Romance collection. 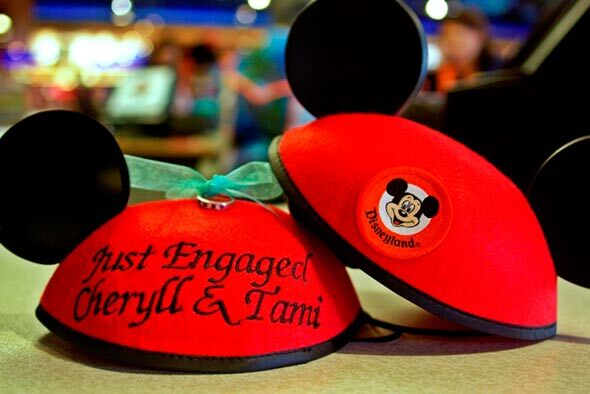 Are you planning on a Holiday engagement, or one for the Summer of 2016? Win her heart with any one of these stunning designs. This entry was posted in News & Events on September 9, 2015 by lovemyromance. Teen Mom OG Finale Exclusive Preview: Maci Bookout's Boyfriend Taylor Goes Romance Ring Shopping! Will He Propose? This entry was posted in News & Events and tagged Engagement, Proposal, EngagementRing, LoveMyRomance, Romance, TeenMom on July 20, 2015 by lovemyromance. One of the most important moments in a woman’s life is when she weds the love of her life. It is a time she has been dreaming about for years and it marks the start of building a life together. The engagement ring ties it all together from the romance of the proposal to the endurance of the marriage. Rings come in different shapes, sizes, and styles. Which ring you choose can say a lot about you. The perfect engagement ring should fit your style and be a symbol of your love that you will proudly display for years to come. Match your wedding ring with your personality to create a personal and a one-of-a-kind look. To help with the decision, we have put together a list of finely crafted engagement rings from Love My Romance matched with different styles of brides. This design is bright as the morning sun. What a beautiful way to cherish your love together. Also an amazing design to show off to your friends and family. Halo Diamond Ring in 18kt Yellow Gold with Milgrain Detail. (D.32 carat total weight; does NOT include center stone as shown). Not every bride wants a traditional engagement ring. Here is a unique design that is elegant. This engagement ring would be a great conversation piece. Semi-Mount Diamond Ring in 18kt Rose Gold. (D3/8 carat total weight, does NOT include center stone as shown). This design style combines a traditional feel with a modern twist. Every morning when you awake, you can see your engagement ring bloom over and over again, just like your love for him. ​Here is another look at the same design style as above, but in Rose Gold. This design style is vibrant and vivid. It is as if he plucked the ring right out of a flower garden just for you! Flower Design Halo Semi-Mount Ring in 18kt Rose Gold. (D1/3 carat total weight,does NOT include center stone as shown). This entry was posted in News & Events and tagged styles of engagement rings, what your engagement ring says about you, engagement rings, love my romance diamonds, engagement rings from love my romance, romance rings, love my romance on June 2, 2015 by lovemyromance. Enjoy your next night out with that special someone who is closest to your heart. Display affection and show them how much they mean to you by adorning them with endless love. We couldn’t think of a more perfect way to do this, than with our favorite list of simple and unique date ideas. Enjoy these romantic gestures and intimate date ideas by carrying them through the month of June and every month from then on. Follow Love My Romance's board Romantic Date Ideas on Pinterest. This entry was posted in News & Events and tagged unique date ideas, creative date ideas, unique dating ideas, Love My Romance Engagement Rings, Romance Jewelry on May 30, 2015 by lovemyromance. Make all her dreams come true with the ultimate proposal. A day where the love of her life will bend down on one knee and ask a question leaving her rejoicing with tears of joy. This grand gesture will express your desire for a lifelong commitment to your love in the most heartfelt way. With the substantial changes in technology, proposal trends have shifted over the years. Venture outside of the box with the latest proposal trends this year from Anja Winikka, managing editor and wedding expert at The Knot. Below are the top 5 trending proposal ideas Love My Romance. This entry was posted in News & Events and tagged Top 5 Proposal Trends, Proposal Trends, Engagement Ring Tips, Love My Romance Engagement Rings, Romance Jewelry on May 29, 2015 by lovemyromance. Vintage and antique engagement rings retain a graceful artistry and tremendous level of craftsmanship that is beyond measure. Drawing upon inspiration from the timeless elegant styles of the past, today’s vintage ring styles are reimagined with a fresh perspective. Fine details help define the designs from intricate milgrain, unique engraved patterns to elaborate filigree and complicated beadwork to create the enchanting vintage aura. Vintage styling offers this generation’s bride a link to the past with an exquisite style that will transcend time. Below are a few gorgeous vintage rings from Love My Romance. Round Halo of Tsavorite Surround this Semi-Mount Diamond Ring in 18kt White Gold with Milgrain and Engraved Detail. Diamond and Sapphire Engagement Ring in 18kt White Gold and Black Rhodium with Milgrain Detail. This entry was posted in News & Events on April 30, 2015 by lovemyromance. ‪Choosing the perfect engagement ring is an exciting time, however, brings a lot of pressure and frustration to those who simply cannot fathom where to begin. Investing in the right engagement ring is the first step towards investing in the future with your bride-to-be. Every woman lives for the moment when the man of her dreams displays the most romantic gesture of his lifetime, resting on one knee as he pops open the little box and asks the magical question! ‪There is a lot to consider when selecting the perfect engagement ring; here are a few tips to help with the process from Love My Romance. Essentially when looking for the right diamond, it is important to know the completed background knowledge of the 4 C’s of diamond quality which are clarity, cut, color and carat. Take some time to research the four C’s before beginning to search for an engagement ring. 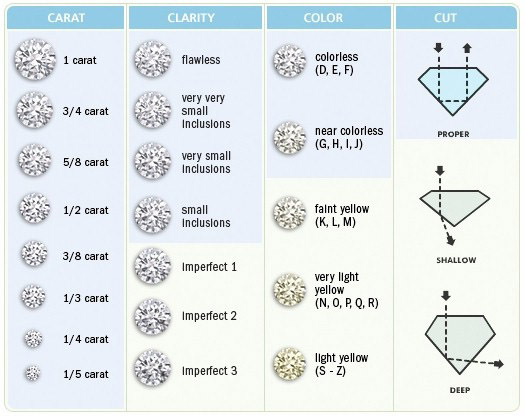 When deciding on the shape of the diamond, it is imperative to try on a variety of different styles as the style chosen says a lot about who you are as an individual. The geometric shape of the diamond also sets the tone for the rest of the ring whether classical and romantic or fashion-forward and modern. 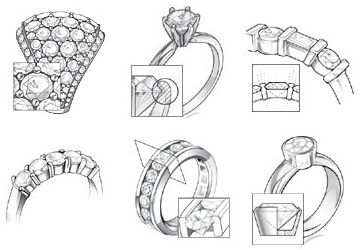 A very important process, this step determines the overall look of the ring, where the combination of the diamond shape and metal framework truly come together, which ultimately enhances the ring to bring out its most appealing qualities. 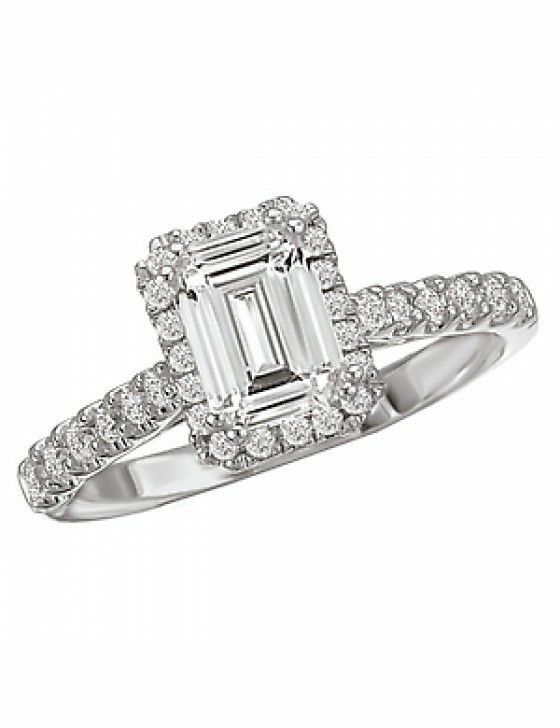 Visit Love My Romance online to view a selection of the World's most exquisite engagement rings. This entry was posted in News & Events and tagged How to choose engagement ring, Tips on Choosing the Perfect Engagement Ring, Engagement Ring Tips, Love My Romance Engagement Rings, Romance Jewelry on April 28, 2015 by lovemyromance. Colored stone engagement rings are a hot jewelry trend. Celebrities like Halle Berry, Kate Middleton, Blake Lively and Carrie Underwood all flaunt gorgeous colored gemstones on their left hand. While gemstone lovers may think this venture away from a standard diamond engagement ring is new, the trend has been popular for ages. More recently England’s Lady Diana’s engagement ring to Prince Charles was a large oval sapphire surrounded by round accent diamonds. Even still, the popularity of colored stone engagement rings traces back to the Art Nouveau era in the late 19th century. A colored gemstone offers a chance for personalization and uniqueness. The bride-to-be is a one-of-a-kind and her ring is a chance to show that! Many couples will choose a stone that is a birthstone, a state stone or just a stone that reflects the bride’s favorite color. Ornate diamond and sapphire semi-mount Vintage engagement ring in 18kt white gold with scroll and milgrain detail. Vintage design round halo semi-mount diamond and ruby ring in 18kt white gold with engraved design. Crowned with a halo of exquisite green Tsavorite, this Vintage style engagement ring shimmers in 18kt white gold with milgrain and engraved detail. This entry was posted in Media & Advertisements and tagged romance brand, one of a kind engagement rings, colored diamonds, unique engagement rings, Colored Engagement Rings, Jewelry Trends, Romance Jewelry, love my romance on April 1, 2015 by lovemyromance. This entry was posted in News & Events on April 1, 2015 by lovemyromance. Romance Diamond Bridal debuts our popular new Vintage Collection in the Spring 2014 issue of The Knot. Drawing upon inspiration from the timeless styles of the past, Vintage is reimagined with a fresh perspective. Fine details help define the designs- from intricate milgrain and unique engraved patterns to elaborate filigree and complicated beadwork. The result is a ring that is as breathtaking as your love and a style that will transcend time. This entry was posted in Media & Advertisements on April 1, 2015 by lovemyromance.